If you are looking for a place to fit in and be yourself, we hope you will join us! ⠀Join us Sunday at 6-8pm! High School Guys House -3157 Bradfield Dr.
We are staying out all night going ICE SKATING, LASER TAG, and BOWLING!! Come join us and bring tons of friends to explore Nashville and have an absolute blast! for our first ever youth mission trip this summer! WHY: Getting out of our normal routines and focusing on where God is at work around us, impacts not only those we serve, but also how we see the world and engage in our faith well beyond the week. We will be joining with other churches for Collide. WHO: This is open to all completed 6th-12th graders. WHAT: Collide is a week-long immersion experience for youth and adults to step out of their everyday routine. Through discussions, service, and active learning, we will learn new ways of understanding and claiming our faith. Throughout the week we will be doing mission and serving projects with kids, gardens, schools and more. We will also be diving deep into what it looks like to partner with God to change the world. What does justice look like? What does it look like to love God and love neighbor? We are excited that this will be an intentionally diverse group of churches working together: Nashville Korean UMC, Primera Iglesia Metodista, South Nashville Church, Preston Taylor Ministries, and more. Our hope is that bringing diverse people, experiences, and stories to the table, we can all have a more full picture of what God is doing in our world. HOW…will it work: We have a limited number of spots, so reserve yours today by clicking “register now” below. So what are you waiting for? Save your spot today! Guys House -3156 Bradfield Dr.
We just wanted to throw a party and have a blast! We hope you will join us! Any 5th-12th graders are invited to join us and bring their friends! $10 at the door gets you in the door, skates, pizza and more! We'll be skating the night away at the Brentwood Skate Center (402 Wilson Pike Circle). So bring your friends to join in the fun! Email Chris with any questions at Chris@thevillagenashville.com. OWNit a 6 week crash course in what it means to follow Jesus. Click HERE for all the info. WINTER RETREAT is always an amazing weekend to gather with other middle Tennessee youth ministries for worship, fun, and building relationships with our group! We go toWarmth In Winter, the annual winter retreat of the Tennessee Conference of The United Methodist Church Young Peoples Ministry. It is an event for youth in grades 6th through 12th and their adult youth workers. The event takes place at the Opryland Hotel in Nashville, TN. Over the years it has grown from 60 youth and adults to its current size of over 2500 youth and adults come together to fellowship and worship. It is a combination of energizing, fun, and worshipful large group gatherings as well as seminars on current issues facing youth and youth workers. The seminars are led by expert presenters, who are passionate about teaching and reflecting the love of Jesus Christ. Winter Retreat begins on Friday Feb 1st, 2019 at 5:30pm at Nolensville/Concord Kroger parking lot. The retreat ends on Sunday Feb 3rd, 2019 around 2:00pm back at Kroger. HS GUY AND GIRLS ALL AT ONE HOUSE THIS MONTH -3157 Bradfield Dr.
We are throwing a giant party on Nov 11th with one worship service at 10am at Sunset MS! We have several teens and adults who will be saying YES to Jesus! Looking for a place to belong and grow in who you are? 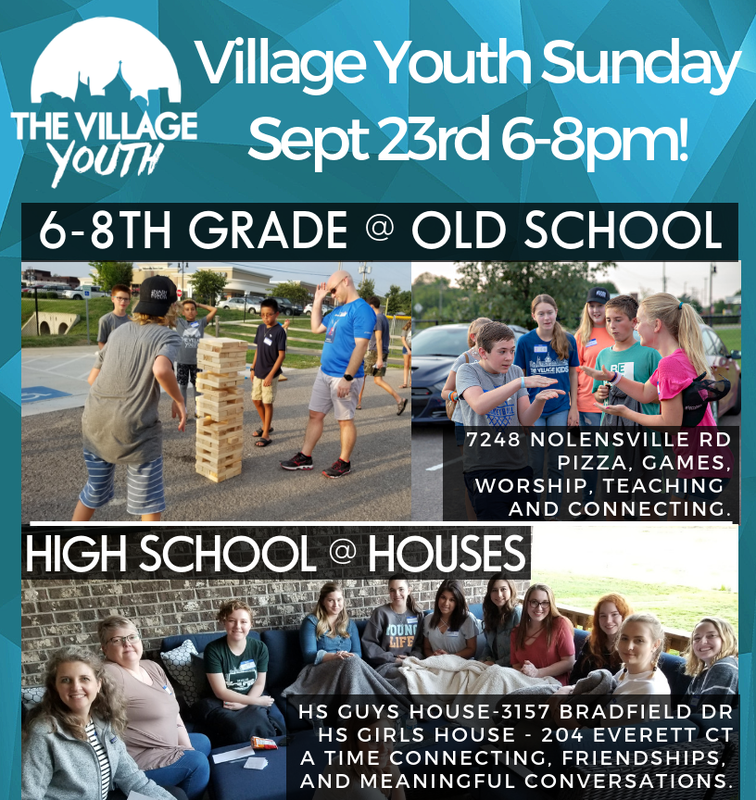 Join us for Village Youth fall retreat as we wrestle with what it looks like to partner with God to change the world. All 6th-12th graders are invited, and it is better with friends so invite them! If you are looking for a place to fit in and be yourself, we hope you will join us and invite your friends! At the Village and in youth group, we talk a lot about being a good neighbor and serving our neighbors. We look at the examples in the Bible of radical hospitality and weigh what we think is reasonable for us to do to in our own lives to serve those around us. Fred Rogers was the master of loving his neighborhood. In his show Mister Roger's Neighborhood (run dates 1968-2001) Fred showed the world the importance of caring for one another to the fullest measure, and that every person can contribute to the neighborhood. In Won't You Be My Neighbor? we get to take a look into the behind the scenes of not just the show, but the courage Fred Roger's had to always choose compassion over complacency. We are excited to kick off the fall by going to the movies as a group! We hope to see you there! Please RSVP by clicking the link below and we will follow up with you on next steps to getting tickets. Don't wait until the last minute! Nashville Food Project brings people together to grow, cook and share nourishing food, with the goals of cultivating community and alleviating hunger in our city. The Nashville Food Project also embraces a vision of vibrant community food security in which everyone in Nashville has access to the food they want and need through a just and sustainable food system. Come join us and bring a friend to work in the gardens and prepare meals for those in our community. Open Table is an interfaith homeless outreach nonprofit that disrupts cycles of poverty, journeys with the marginalized, and provides education about issues of homelessness. Come join us and bring a friend for a hands-on learning experience in downtown Nashville that involves interactive discussions about the causes, effects, and realities of homelessness, ways to break cycles of poverty and homelessness, a scavenger hunt in the downtown area, and a walking tour of some of the places downtown that are important in the lives of the un-housed community. Camp Village Kids is an incredible day camp for any rising 1st - 5th graders in the community. Kids will explore, worship, play, create, learn and serve together in a summer camp atmosphere that will create memories for a lifetime. Come join us and bring a friend to help our community of rising 1st- 5th graders know they are loved by God and know they belong! We got our dates crossed. Stay tuned for updates but we will not be doing it this week. The Word Wagon is a literacy organization dedicated to changing children’s lives one book at a time. Traveling around middle Tennessee, The Word Wagon promotes childhood literacy, provides reading opportunities, and places reading materials into the hands of children who lack access to books. Come join us and bring a friend as we help this awesome organization! CSM (City, Service, Mission) provides an effective urban ministry experience that transforms lives, influences churches and communities, and honors Christ. CSM helps you to experience, learn, and help a city. Come join us and bring a friend as we help CSM with the prayer tour which will take us through our community of Nashville and have an opportunity to pray for our neighbors. Radnor Lake mission is to protect, preserve and promote the natural integrity of Radnor Lake through land acquisition, environmental education and park support. Volunteer projects include exotic plant removal, mulching trails, and planting native vegetation. Come join us and bring a friend to clean up our amazing parks and celebrate National Trails Day! MEET AT GRANNY WHITE ENTRANCE. We believe being discipleship happens in circles, small groups are those circles. A place to know and be known, to encourage, challenge, and share together as we strive to flow Jesus. Our next small group night on April 29th! Be sure to mark your calendars because we want to see you there! If you'll be there, be sure to bring a snack to share!! Why? We are partnering with Project Transformation this summer to help with their summer program. These are the items they are in need of right now for the start of their camp programs. So bring a one or a few or a few of each of these items and we'll be sure to deliver them to the group! Thanks so much!